y to have in the refrigerator, and they can turn plain food into a delectable delight. You can keep these chocolate sauces in suitably-sized glass food jars, providing they have tight fitting lids. The sauce should be kept in the refrigerator and, as a rule, will last about three weeks. Use as a topping for angel food or pound cake, pancakes, crepes, fresh fruit or ice cream. You can also use chocolate sauce as a sweet fondue dip. Add a square of gingham or calico to the lid, then tie with ribbon, for an appealing gift in a jar for family and friends. In a saucepan, stir together the white sugar, brown sugar, cocoa, flour and salt. Add butter and water and stir well.Bring mixture to a boil, then simmer for about 10 minutes, stirring occasionally. Remove from heat and stir in vanilla. Sauce will thicken as it cools. Once sauce has cooled to room temperature, pour into two-cup jars, seal with an airtight lid, and store in the refrigerator for up to three weeks. Yield: Make approximately 1½ pints. Recipe can be doubled to make 3 pints, or about 6 cups. 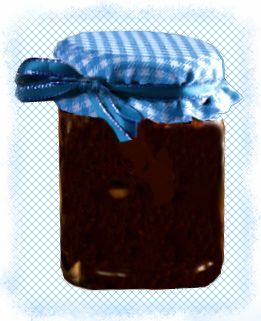 Note: Give the jar by itself or as part of a gift basket containing other items for ice cream sundaes. Hot fudge sauce can also be added to chocolate milk, hot chocolate or coffee. A rich chocolate sauce brimming with the taste of roasted hazelnuts. 1. Melt butter in a medium saucepan over medium heat. Add nuts and saute for 5 minutes or until lightly browned. Remove from heat. 2. Stir in sugar, cocoa and salt. Blend in corn syrup, mixing well; stir in cream. Return to medium heat and boil gently for 1 minute, stirring constantly. Remove from heat and stir in vanilla. 3. Pour into a clean jar with a tight-fitting lid. Store in refrigerator for up to 3 weeks. Makes 2 cups. This is a well-produced video showing each step of the process to make a delicious chocolate sauce, from Chef Crowley, owner of the Culinary Classroom in Los Angeles. In small saucepan, heat cream over medium heat just to boiling. Remove from heat. Reserving 1/3 cup chocolate, add remaining chocolate and corn syrup to cream. With wire whisk, blend until smooth. Pour into small bowl; stir in half and half. Cover and refrigerate at least 3 hours. Stir in remaining chocolate. Serve chilled over ice cream. Store in air tight container in refrigerator. Warm your favorite chocolate sauce recipe in a fondue. Offer your choice of the following dippers: strawberries, pieces of fresh or dried fruit, candied ginger, meringues, marshmallows, brownies, soft cookies, wafers, biscotti, graham crackers, pretzels, cake slices, chocolate bars, lady fingers. Check out How to Poach Pears for simple directions with step-by-step photos or do a recipe search for poached pears. You can also choose from these Videos on How to Poach Pears on YouTube. Serve the warm pears on individual plates. Drizzle warm chocolate sauce over pears and, if desired, sprinkle with almond slices and serve with a scoop of ice cream or a small cloud of whipped cream on the side. Mix cocoa and water in a saucepan. Heat and stir to dissolve the cocoa. Add sugar and stir to dissolve. Boil for 3 minutes over medium heat. Be careful not to let it get too hot and boil over. Add salt and vanilla. Cool then pour into a glass jar with a tight lid. Can be stored in refrigerator for several months. Yields two cups.